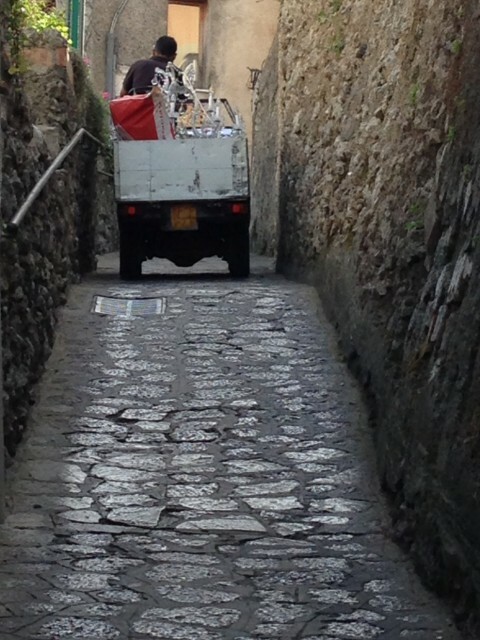 Ravello is full of narrow, steep streets that can accommodate only one vehicle at a time. 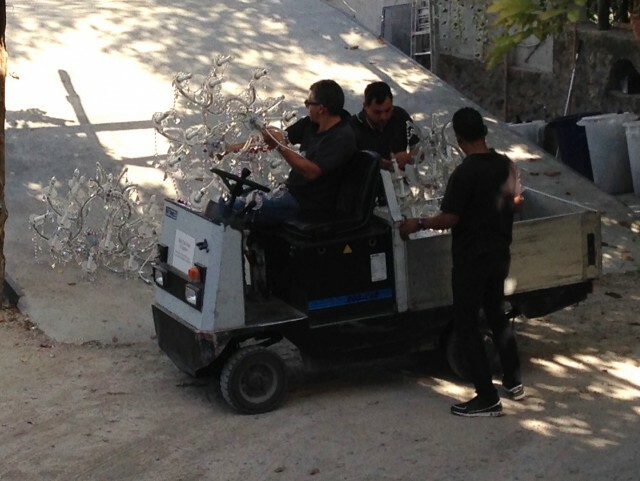 This chandelier delivery in the back of an Ape truck made me wonder if it made to to its destination safely. And actually it was not just one chandelier! Incredible! What do you think? I’d love to hear your feedback. Please leave a comment. Look at those chandeliers! They are so delicate too…amazing they made it to their destination safely. I want an APE. I just love those mini trucks. In fact, at this stage of my life that is probably as big a truck as I need. No more hauling horses nor dogs around, no more kids, grandkids grown or living in other states. Yep, me and an APE going to the feed store for hay and feed with the mystique of Italy in the air. . . and Dade City even has cobblestone roadways here and there for us locals to navigate. Maybe Margie will take a picture of me, roflol. 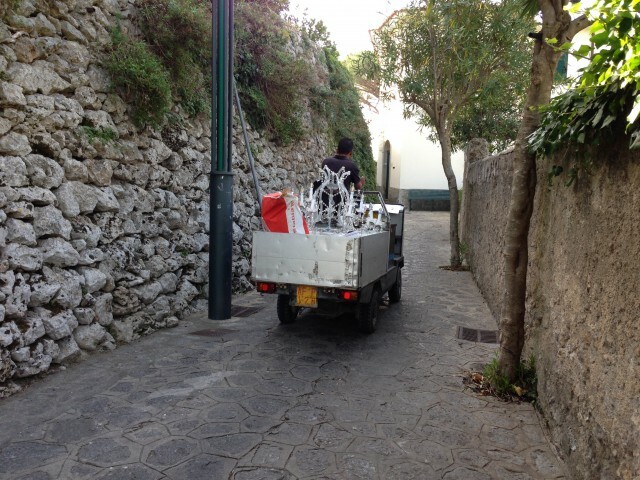 Aren’t they wonderful pieces of machinery especially in areas like the Amalfi Coast! 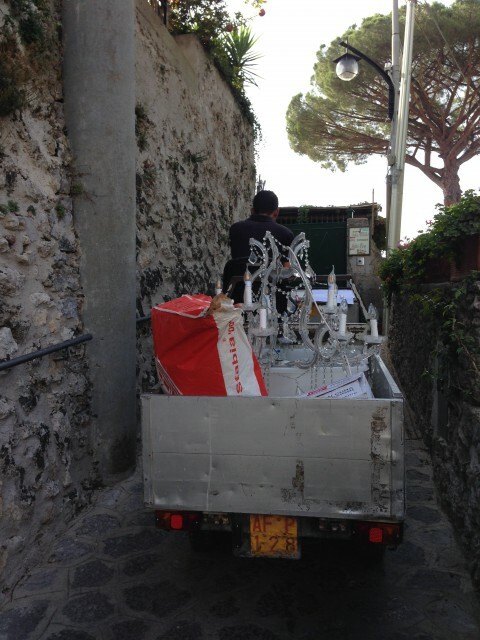 What was even more amazing was the sight of the working donkeys in the narrow alleyways in Montepertuso and Nocelle above Positano – you really felt for them when you saw their heavy load of building rubble. They worked so hard poor things! Love this picture! interesting way to transport the lampadari! I love ape-they even the noise they make is cute.